If you know Norse mythology, you know that Ragnarok is basically the doom of Asgard. It is the end of all things. Can Thor, god of thunder, stop the cataclysm from happening? Going by the first minutes of the film, yes. Yes he can. When last we saw our intrepid Avenger, Thor had flown off in search of the Infinity Gems (the shiny MacGuffin devices from half the franchise). Finding none, he is now in search of the cause of his dreams: dreams of Ragnarok. It leads him to Surtur … some sort of magma …Satan … thing. Surtur monologes a bit about how he will destroy of of Asgard, bwahahahaha … and Thor interrupts him for some comic moments, and we’re off. However, the end of all things isn’t quite averted. Hela, goddess of death, has been trapped for half a million years, and she’s out, she’s pissed, and she’s ready to rule everything. So, nicely epic. But can they pull it off? After resolving some dangling plot threads in Thor’s arc, we go straight into the film. When Hela is released, Thor and Loki are the first people she sees. Due to a problem with the Rainbow Bridge, the brothers don’t get a full confrontation with Hela, but are thrown onto an alien planet. 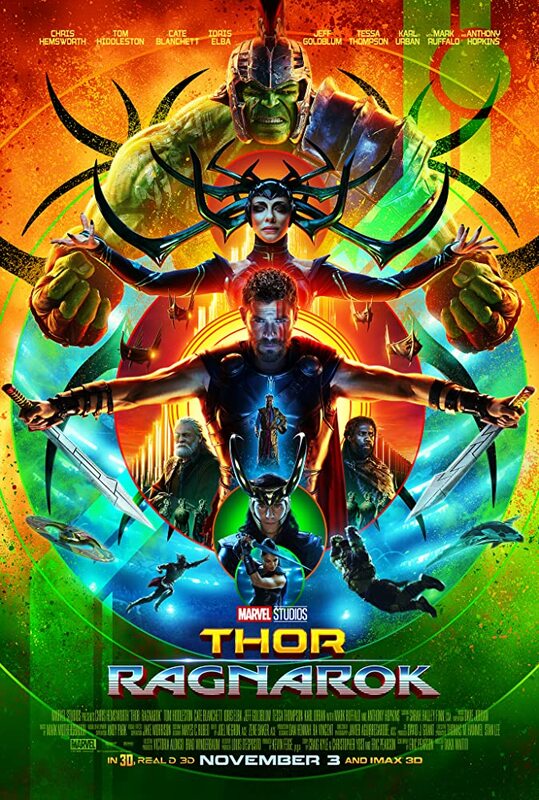 Thor is captured via cheap technology tricks, and is thrown into a gladiatorial arena owned by Jeff Goldblum….sorry, the “Grandmaster.” Yes, Jeff has tired of playing with dinosaurs, and wants to play with comic book characters instead. At least he left his stutter at home. It’s all very strange. Then again, the whole film is strange from start to finish. There is a definite departure in tone from the other Thor films, giving it more of a Guardians feel. Thor, the deadly serious, makes for a surprisingly good slapstick artist. I was surprised. I think I laughed at this one more than I did at Guardians. All in all, this was straight up fun. There are shoot outs that make me think of Flash Gordon (the one with Topol, Queen, and Max von Sydow) to such a point that I thought excerpts of the soundtrack would start playing at any moment. At one point, “Pure Imagination” does start playing. Yes, really. There’s comedy. There’s some well-done plotting. Nothing is really forced (okay, one scene is, to be discussed below). I’d even say the Pulp crowd would be entertained, given that we have a space ship firing a machine gun at Fenris while a horde of zombie soldiers are being mowed down by a lightning-wielding demigod, who shot his way out of an intergalactic gladiatorial ring with a laser rifle. Now, you know that there are several elements they must address in the film, such as the post-credit scene in Doctor Strange. You know from the end of The Dark World that Loki is on the throne of Asgard, pretending to be Odin. You know that Thor was looking for the Infinity gems. You know that someone might want to mention that Jane Foster (Natalie Portman) isn’t in this movie — and frankly, I have no idea how they could have fit her in on top of everyone else. All of these plot concerns are actually addressed and resolved within– at a guess– about fifteen minutes in. I have two major problems with the movie, and a minor one. One, we have a moment that is a variation on the “you have hidden depths” meme that we’ve seen before — though I don’t have a problem with how they did it, I have a problem with where they put it. It’s rather awkwardly jammed in. I blame whoever edited the film together. It’s fairly jarring. You’ll probably catch it. I liked the scene itself (it could have been a minute longer), and it was well written, but it’s sort of shoehorned in, like the editor went trigger happy somewhere along the line. I know there are several shots and lines of dialogue cut from the trailer to the film; I know that it happens, but given some parts of the ending, I think someone went overboard. My second major problem: character deaths. Of the five character deaths in this film, only one is lingered on for any length of time. The other four were murdered off-handedly, making me wonder why some of these actors were even brought in for filming. The acting is surprisingly well done. Hemsworth is a great straight man, and pulls off the big epic moments, as well as the slapstick. Don’t worry ladies, you’ll get shirtless Thor — though he seems to have bulked down, and has gone more for martial art muscle than gym muscle. Cumberbatch as Strange is even better and funnier here than he was in his own movie. It was fun, and they got rid of him in a matter of three minutes– a good thing, since he might have stolen this film if he was more than a cameo. Tom Hiddleston as Loki … is Tom Hiddleston as Loki. Has anyone ever had any problem with his Loki? Loki’s still insane, but dang, he’s got style. And he knows how to make an entrance. Hela … is a serviceable villain. She’s fun, and she leaves more of an impression than the dark elves from The Dark World. She even comes with her own army of zombie Rivendell elves. Yes, I know they’re supposed to be old Asgard warriors. And she comes with Fenris as her pet. She also has motivation. It’s simple and straight forward. She’s more Kali by way of the thugee, so she doesn’t really need much. Karl Urban as the Executioner … while I like Urban, I’m not sure that this character is anything like the comic book, except with some mild overlap. I presume that this is the last Thor film, for multiple reasons, but most of all because they felt the need to jam in certain characters without bothering to make them anything like their comic book counterparts. Aside from these complaints, which are largely nitpicky on my part, this was a fun film. It is certain this is the best Thor film. It’s possibly the funniest Marvel film. Though I’m surprised at their restraint, plot wise: I had expected at least new one Infinity Gem, and didn’t get one. If I recall correctly, there are still two missing. Ragnarok is definitely recommended on the big screen. 8/10. This entry was posted in Fiction, Reviews, Superhero and tagged Film, Loki, Marvel, Marvel Cinematic Universe, Movies, Thor: Ragnarok. Bookmark the permalink. Fine review, it’s basically what I thought of the movie: good, entertaining fun. Just to note, not to be “that guy” to correct things, but there is one missing Infinity Gem. The rest are accounted for in some fashion: the Tesseract (Space Gem), the Aether (Reality Gem), the Eye of Agamotto (Time Gem), the one in Vision (Mind Gem) and the one under Nova Corps control (Power Gem). All we’re missing is the Soul Gem, though they’re down to only revealing it in Black Panther before Infinity War part 1 shows up. I’m betting, seeing trailers for Black Panther and having not seen the Gem in this movie, they’re probably waiting until Infinity War to bring it into play.